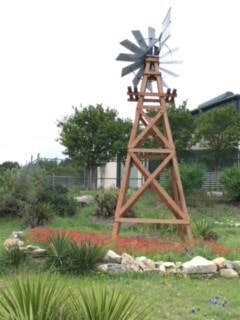 Keep Lago Vista Beautiful is a City of Lago Vista committee formed in 1992 by mayoral proclamation to promote the well being of the community by developing programs for cleanup, recycling and use of Lago Vista resources. During the early years, KLVB developed programs to address many environmental issues such as curbside recycling, and city-wide fall and spring collecting of tree trimmings and trash brought by citizens. Adopt-a-street, anti-littering, landscaping and beautification programs were also added. Beginning in 1997, several major beautification projects were planned, financed and completed. These include what is now known as Bowden Point and the corner of Lohman Ford Road and Paseo de Vaca. Through private funding, the Lago Vista Property Owners' Association and KLVB volunteers identified four prominent locations where attractive stone and wood directional signs were erected to assist passing visitors. KLVB purchased three sets of hanging banners; the sailboat, Christmas theme, and patriotic. KLVB also purchased and had installed the iconic aluminum "sailboat" atop the pylon at the intersection of Lohman Ford Road and Dawn Drive; developed the scenic overlook trail at the Sports Complex; the windmill at Lohman Ford and Paseo de Vaca; and the wind spiral on Dawn Drive at the traffic circle. Throughout the years, KLVB has been greatly assisted by city workers who install the majority of Christmas lighting displays, hang banners, provide and operate backhoes to dig holes for trees, collect trash, and chip tree and brush trimmings. KLVB pursues community projects through generous donations of funds and volunteer manpower. Private donors, civic organizations and the City of Lago Vista fund these projects. Success depends on the dedication of current and new volunteers.